The glass is half full! I’m going to proceed on the basis that you can have a decent stereo in a 996, anyway. Can anyone recommend a decent six channel amp? Or, coming at this from a slightly different angle, why should I not buy this one? I agree that's massive overkill. Above 70mph you won't tell the difference between this and some ACME no make from China. Get two Pioneer GM-D1004 amps. use one to power the main speakers, the other to drive the door speakers. That will do you. I had not thought of using two smaller amps. Would the JL 6 channel not fit in the stock location? I am (possibly wrongly) assuming that it's easier to fit one amp rather than two? Ohhh, I just remembered, this is project ridiculous! No, that amp is absolutely fine for the job! Yes it's total overkill and you will barely use 20% of its power but I can see the attraction of it from project ridiculous point of view plus all the fiddling you can do on the amp controls..
What's the view on the door speakers - good enough, or would they benefit from being changed? Regarding the degree to which this particular project should be judged ridiculous, I'd rather rein it in somewhat - two smaller amps may well make more sense here, as that appears to be a significantly cheaper option than one larger one. In previous installs in other cars I generally used a 4 channel to drive the main 4 speakers and a 2 channel bridged to drive a 12inch boxed sub as they can munch up some power, plus back then there were not many 5/6 channel amps around. no more difficult to wire up two than one amp as you Daisy chain the power. Revelling in my almost total ignorance of these things I’ve found the Hertz EV 130.5 - good woofer for the doors, or insane and ridiculous? you not going to go far wrong with those if they fit, yes insane and ridiculous of course..
Those Pioneer amps are tiny - i have one driving the door speakers in LF mode and I think it sounds much bigger than its size suggests. But the H/U drives the little 4" speaks - again, they aren't big speakers so it seems pointless to overpower it. 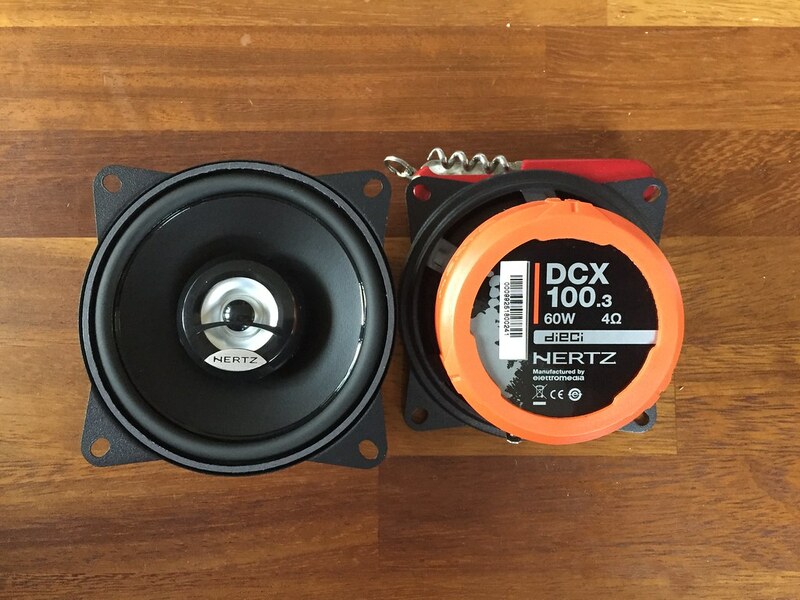 The door speakers are very good quality (better than the dash ones) and worth keeping. You'll struggle to replace them without cutting / modifications as you'll never find 5 1/2" replacements, so you'll have to use 6 1/2"
Trial fit of the sub today as I have the car back - it's close, I suspect it could be finessed, but it clearly wants a lower centre console to be next too, and I don't have one. 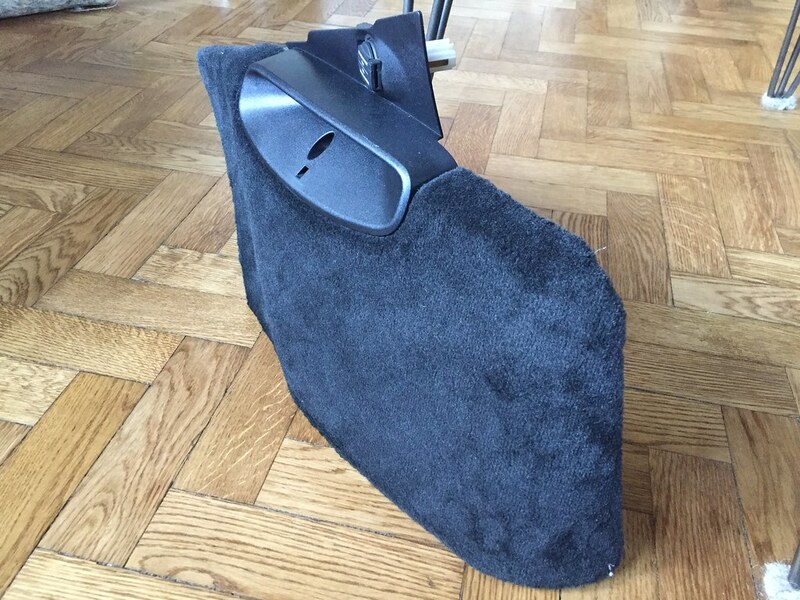 I think, therefore, that either a sub-seat sub is the way to go, or rely on the door speakers for bass. If anyone (who has a centre console, or is fearless when it comes to cutting up carpets) wants a sub please let me know. I’d take the sub off your hands but I’m too far away to collect! I have the Focal iBus25 but you're right - underseat is inaccurate - it's more like "rear foot-well"